Wu Chi-Tsung, Wrinkled Texture 027, 2015. Cyanotype (detail). Courtesy of the artist. Brief biography: b. 1981, Taiwan. Lives and works in Taiwan. Chi-Tsung is concerned with the poetics of nature and the intersection of traditional art forms and contemporary technology. Wrinkled Texture 027 re-interprets traditional Chinese landscape painting (Shan shui). Exploring the textures of mountain terrains, the flows of rivers and water, or celebrating the quiet beauty found in nature, Shan shui paintings traditionally offer a subjective view of nature, while demonstrating the artist’s calligraphic skill. 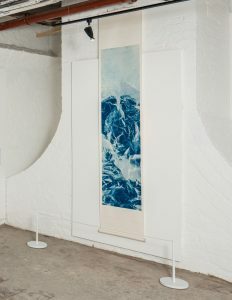 In Wrinkled Texture, Chi-Tsung takes an innovative approach to Shan shui, by working with the photographic ‘cyanotype’ technique. Covered in photosensitive solutions, rice paper sheets were folded and reshaped while being exposed to sunlight for thirty minutes. After the paper was washed, the creases, lines and folds were fixed as an abstract image of blue hues and textures, akin to mountain precipices and cliffs. Substituting ink washes and calligraphic lines with experimental photographic techniques, the artist reinterprets the imaginary landscapes of ancient Chinese culture. Wu Chi-Tsung, Wrinkled Texture 027, 2015. Cyanotype. Installation shot at St. George’s Hall, Liverpool. Photograph by Pete Carr. Wu received his Bachelor of Fine Arts from the Taipei National University of the Arts in 2004. He has exhibited widely in Taiwan and across China. Sponsored by Taiwan’s Ministry of Culture, his work first toured the UK in a solo show in 2014, delivered by a partnership programme between the Centre for Chinese Contemporary Art, Live at LICA, Lancaster and Site Gallery, Sheffield. In 2014, he was listed as one of the top 10 artists under 35 by the international website Artsy. Exhibitions include: PRESENCE: A Window into Chinese Contemporary Art, St. George’s Hall, Liverpool (2018); Far from East, Kϋnstlerhaus Bethanien, Berlin, Germany (2017); Inward-scape, Galerie du Monde, Hong Kong; Dust, Site Gallery Sheffield, UK; Recalibrate, Peter Scott Gallery and The Storey, Lancaster, UK (2014).